This 6-week group explores the natural world as teacher. We will meet outdoors as the weather allows, and apply the tried-and-tested ecological principles of permaculture design to the thorny struggles that we face daily: Where did all my time go? When do I get to live my wild and important dreams? How do I discover and serve my purpose in this world? Why do I feel exhausted and worn thin instead of juicy and delighted? Who is my tribe? What can I do to engage in life in a way that honors my full potential? Co-facilitated by Anastasios Pantelopulos of Forest Light Counseling. Anastasios brings his expertise in wilderness therapy, gestalt therapy, and rites of passage to this group. Every good permaculture design starts with observation, and Stas will teach us skills for witnessing ourselves through the wisdom of the natural world, the information coded in the body, and the power of ritual. Co-facilitated by Lissa Carter of Inner Light Counseling Collective. Lissa's experience as a certified permaculture designer, herbalist, farmer, and wilderness skills fanatic has always colored her approach to counseling. She firmly believes that we are natural beings, and therefore grow deeply healthy as we learn our place within nature. 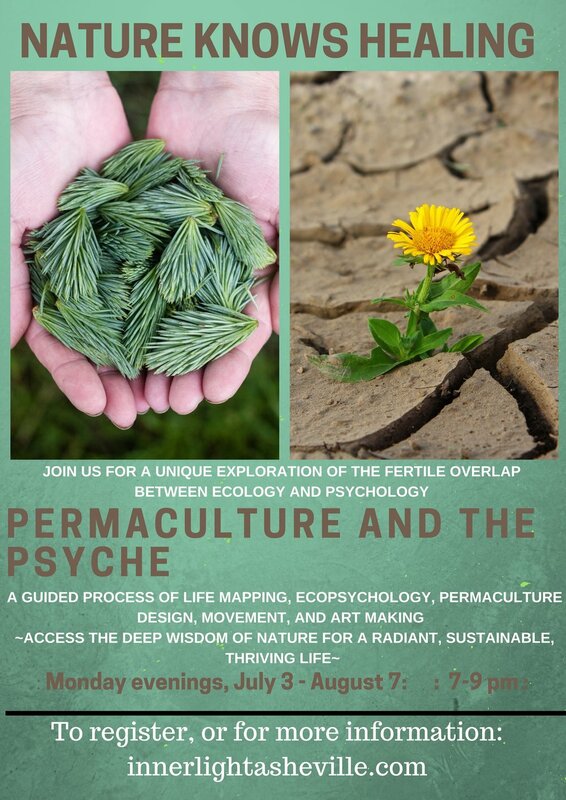 This six-week gathering will dive deep into the fertile area where ecology and psychology overlap. We will build skill in observing ourselves, understanding our patterns, and transforming the behaviors that lead to suffering by applying permaculture principles to life design. All sessions will include outdoor activities as weather allows. Tea, herbal delicacies, and art supplies will be provided. Thank you! Lissa will be in touch shortly. Who takes care of mama?